We welcome all students of art whether a complete beginner or someone with much experience. We firmly believe that everyone has the ability to draw or paint given the right tuition and encouragement in a positive environment. We have an absolute maximum of 7 places per week so it is possible to give you all the time and attention you need. The studio is well equipped and spacious although we usually work out of doors in one of the many areas of the garden or out in the surrounding landscape. There are also air drying clay, plaster and other sculpting materials. Tutored painting sessions are from about 9.00am - 12 noon and 2 - 5pm. But everything is flexible here. The studio is open all day, and Pheona is always around to help you. Rather than have set courses each week we tailor your painting holiday to suit you and you choose exactly what you want to learn or do. When you arrive we have a chat (and perhaps you have brought some photos of your work with you) and then we design an individual but flexible 'course plan' for you. Of course, you can also just 'take each day as it comes' just enjoying being creative. You learn and create best when relaxed and enjoying yourself so you'll find that the beautiful environment, the personal attention and the company of like minded people all contribute to you being able to be at your most creative. 'Giggling' is thoroughly recommended for good art! All art materials are provided free of charge.You can browse through the following 'Ideas for Artists' to see that we cover a wide range of subjects and methods. You have breakfast in your own apartment, whenever you like, from a selection of breakfast foods in your kitchen area. For those on the first and second floors it is lovely to have breakfast on the balconies watching the sun rise over the mountain. On the ground floor you have a number of areas you can choose to have your breakfast. This is a basic outline, but it is nice to go on excursions and allow the week to develope organically according to the wishes of the group. Water-colour is a unique, sensitive and beautiful painting medium and not as difficult as it seems with the right tuition You will be shown how to build up a water-colour painting step-by-step with demonstrations and personal guidance. The approach to acrylic and oil painting can be seen as similar, given that both are opaque painting mediums which are built up with a thick rich paint consistency. The basic difference for the beginner is that acrylics are water based and dry within 5 minutes which means you can build up layer upon layer without waiting for a long drying time. Oil paints take days rather than minutes to dry. The advantage is that you have more time with oils to blend and make subtle alterations to your work. You can learn either, or both techniques here.....easy peasy! We are surrounded here by beautiful scenery and you need go no further than your balcony to find a scene to paint! 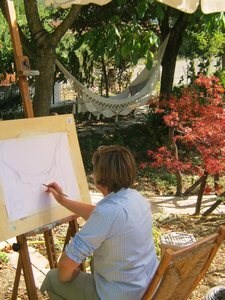 We can take you to local areas of scenic beauty to sketch, paint or take photos for working on later. Portraiture is one of Pheona's specialisms and you can learn how to create a likeness, perhaps starting with a drawing and moving on to painting in either water-colours, oils or acrylics. We will work from life models which is far superior to working from photos. Figure drawing has always been a challenge for the artist any inaccuracy with the human figure is immediately seen. In this respect it is one of the most challenging, yet rewarding of artistic skills. We cover a variety of poses throughout the week. This year we have no set life drawing course but if there is demand we can organise one. If you are interested in life drawing/painting you can use an ordinary painting week to develope your skills in this area. For example, learn about anatomy, proportions and balance using classical sculpures. Learn how to draw and paint, hands feet and portraits. And then we can work on some figure drawaing or painting using a local model. 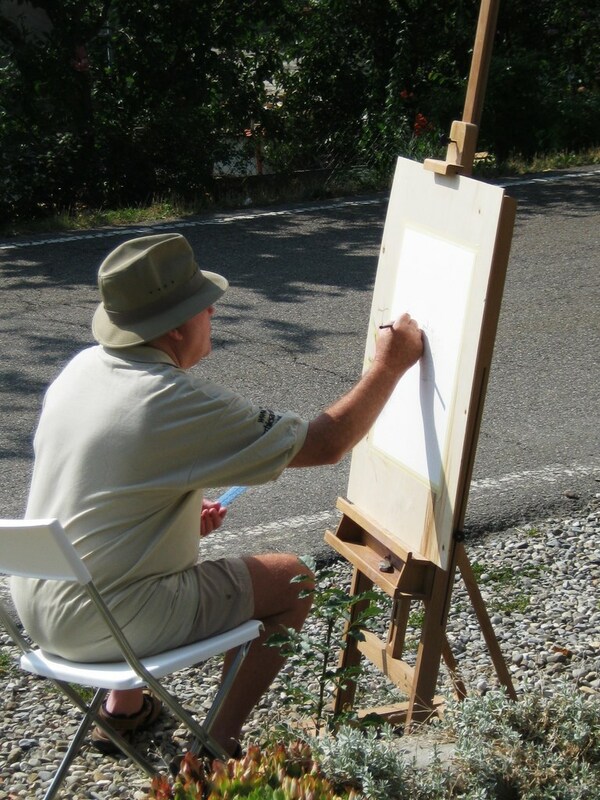 You may like a holiday combining walking and painting. There are many beautiful walks full of inspiration for any artist, all year round. We walk and talk, make sketches and take photos. The walks are chosen according to the abilities and choice of the guest. Perhaps you are an experienced artist who wants to develop your work but don-t know which direection to take. You could spend your holiday learning different painting techniques. From using the palette knife, trying pointillism, different underpaintings, using texture, collage, mied media. Whether you work in oils, acrylics or water-colours, learning how to use the colour wheel can really help you understand colour, mixing colours more easily and use different colour strategies to improve your painting skills. Sometimes it is good to take time to explore the techniques of other artists you admire. It is possible to try out a variety of styles in one week.....perhaps... Impressionism, pointillism, surrealism and abstract painting. For example you could take the same subject and paint it in different styles thus exploring new ways of thinking. It also makes a great topic for discussion and understanding. You can spend a week exploring different types of abstract art. By actually trying the different styles yourself you will come to appreciate the skills involved. In a week you can make about 7 different types of abstract painting, from self expression to geometry, learning about the meaning of line and colour, relationships of shape and form. Fascinating. This is a popular course in which students are delighted with their work. Not only that, they have gained an insight and appreciation of the work of many other artists. A sound knowledge of perspective is essential if you wish to draw or paint buildings, streets, furniture or other geometric objects. You will learn the basic rules of perspective with Pheona's easy-to-understand tuition, reinforced with demonstrations and illustrations. In a short time you will be able to apply the principles to scenery about you thus allowing you to improve your art work and take the difficulty out of those subjects. If you love animals take a week to explore how to draw and paint them well. We start by looking at structure and anatomy - it sounds serious, but it is fun and essential! Then we move on to drawing animals from photos and models and after that we can visit nearby stables of farms to work from life and develope sketchbook technique. Good composition is essential to making good paintings and not everyone has a natural grasp of this. You can learn quickly and easily how to make your paintings more dynamic by clever use of composition. This is usually a fun week and students are aimed by the improvement in their paintings by learning just a few basic rules. Most artists would probably admit that they never stop learning and for those who wish to move out of their comfort zone and try some advanced techniques which will give you stimulating advanced ideas to help improve your work. If anyone wants to try sculpture we are more than happy to encourage you. Learn how to use your camera to make better photos, how to upload images on the computer and use simple software techniques to improve your photographs. Learn to use your sketchbook more effectively. Then learn how to use both the photographs and the sketchbook together in order to make a better finished painting. With all the best intentions in the world you will leave our week long holidays enthused, enriched, enabled and full of confidence and new knowledge about how to continue with your chosen art form. However, sometimes it is difficult to maintain that enthusiasm when you are back home. Pheona has made several 'Home Study' courses to help you continue with the art work you started here. You can work your way through the 20 projects in your own time. The projects are set out so that you undertake a different or more challenging painting each time, thus continuing to improve and learn at home. They are full of hints and tips about how to go about each project. These courses are ideal for the student who wishes to build up a portfolio. All you need is a computer and a connection to 'Skype'. We will give you more information when you are here in Italy. Design by Bsc Informatica S.n.c. Villa Minozzo (RE) © Copyright artholidaysinitaly.com Tutti i diritti riservati.